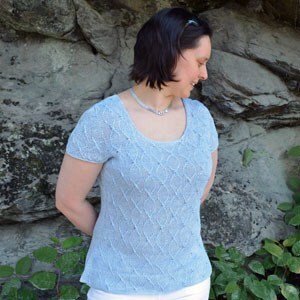 The tech edited and test knit pattern is fully written with a schematic. The pattern repeat is both written and charted. Construction: top down with side seams. The optional set in sleeves are top down as well. Blocked Bust: 32”/ 81cm (34”/ 86cm, 36.5”/ 92cm, 38”/ 97cm, 40”/ 102cm, 42”/ 106cm, 44.5”/ 113cm, 46”/ 117cm). Total Length: 21.25”/ 54.5cm (21.5”/ 55cm, 22.5”/ 57cm, 22.5”/ 57cm, 23”/ 58.5cm, 24”/ 61cm, 24.75”/ 63cm, 24.75”/ 63cm). 26 sts and 34 rows over 4”/ 10cm in pattern repeat. If substituting yarn, make sure your blocked stitch gauge matches and follow the “If substituting yarn” sections throughout the pattern. 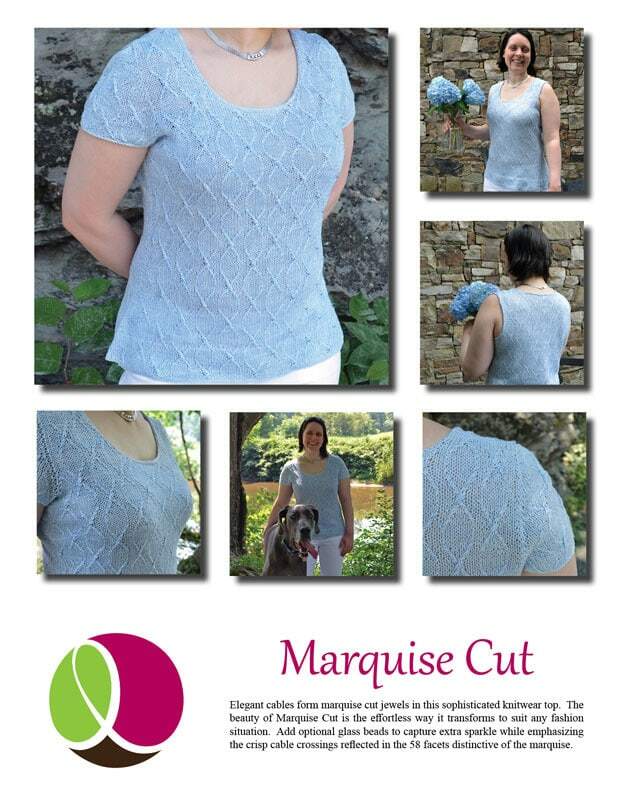 Constructed top down, this design includes optional beading shown on the front only for a little extra marquise sparkle.